Thank you. See you. Bye. Lee Woolery|Troy Daily News Troy’s Adam Decerbo forces a safety during Friday’s game against Turpin at Troy Memorial Stadium. 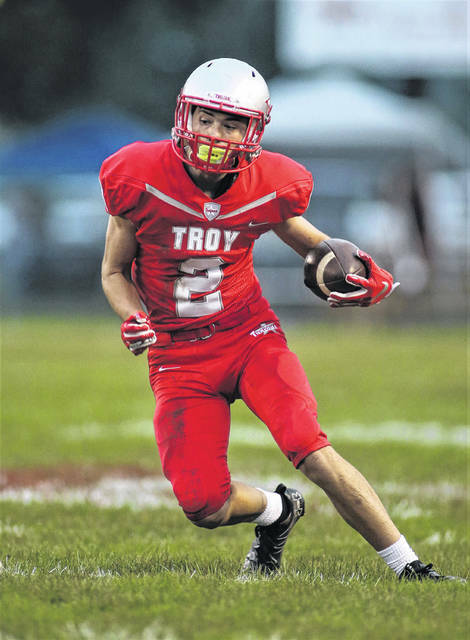 Lee Woolery|Troy Daily News Troy’s Jaydon Culp-Bishop runs a free kick back for a touchdown after the Trojan defense forced a safety Friday against Turpin. 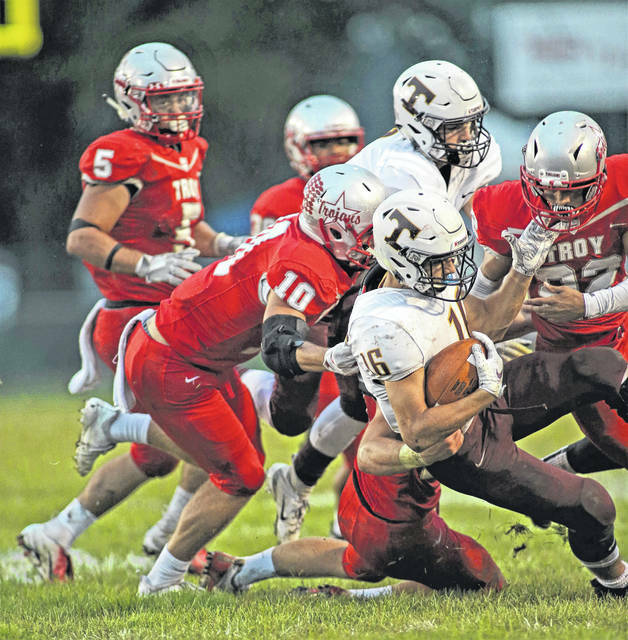 Lee Woolery|Troy Daily News Troy’s Spencer Klopfenstein breaks past the Turpin defense for a big gain Friday. 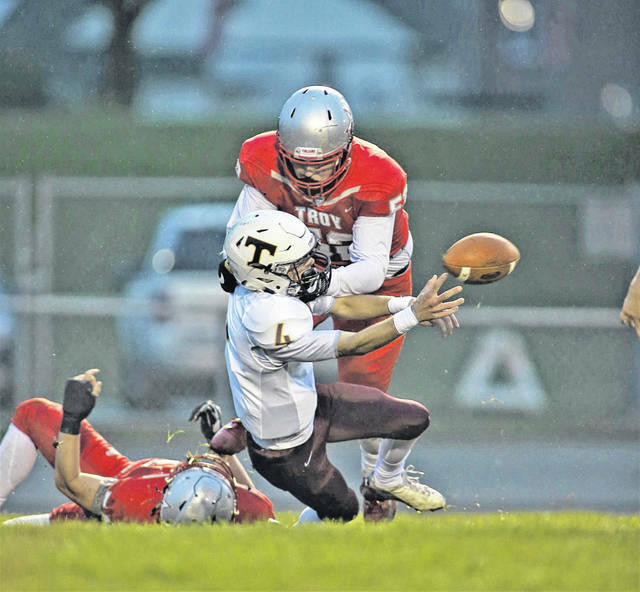 Lee Woolery|Troy Daily News Troy’s Blake Burton stuffs a Turpin ballcarrier Friday. Lee Woolery|Troy Daily News Troy’s Tucker Raskay carries the football Friday against Turpin. Lee Woolery|Troy Daily News Troy’s Jacob Adams (10) and Kobe Feltner (22) stuff a Turpin ballcarrier as Sam Jackson (5) looks on Friday. Lee Woolery|Troy Daily News Troy quarterback Brayden Siler scrambles for yardage Friday against Turpin. Lee Woolery|Troy Daily News Troy’s Kobe Feltner (22), Jacob Shoop (30) and Jaydon Culp-Bishop (8) break through the banner during the pregame festivities before Friday’s game against Turpin. TROY — Two words ran through Matt Burgbaher’s head when he saw the kick coming toward Jaydon Culp-Bishop. “Thank you,” the Troy football coach said. Thank you, See you. Bye. Culp-Bishop’s 75-yard touchdown return on a free kick following a Turpin safety gave the Trojans the momentum they needed in a 29-7 win over Turpin Friday at Troy Memorial Stadium on Troy Athletic Hall of Fame Night. With the win, Troy improved to 3-0, while Turpin fell to 2-1. With game tied 7-7, Troy drove down to the Turpin 5 but fumbled the ball away on second down. That may have actually worked to Troy’s advantage, however, as three plays later, Turpin quarterback Justin Silverstein dropped back into his own end zone to pass, slipped and then righted himself. As he was being pressured, however, he threw the ball away, drawing an intentional grounding penalty, which resulted in a safety to put the Trojans up 9-7. On the ensuing free kick, Turpin kicked a line drive to Culp-Bishop, who gathered it in at his own 25 and sliced right through the heart of Turpin’s kick coverage team, racing 75 yards for a touchdown to put the Trojans up 16-7. Troy’s defense would thwart a pair of potential Turpin scoring drives following Culp-Bishop’s kick return, with Weston Smith picking off a pass at the Troy 11 and the defense forcing a missed 45-yard field goal attempt. Culp-Bishop, who already had 85 rushing yards at halftime, gave much of the credit for his monster night to his offensive line: tackles Jesse Westmeyer and Nathan Garber, guards Marshall Brueckman and Jakob Moorman and center Riley Hubbard. Culp-Bishop’s might would be more than enough on a night in which the Trojan defense was near perfect. Aside from a 43-yard touchdown pass on a blown coverage early in the game, the Trojan defense shut down Turpin the rest of the way, giving up just 208 yards in total offense — 30 yards fewer than Culp-Bishop had by himself. Up 16-7 to start the second half, Troy came right down the field and scored to go up 22-7. 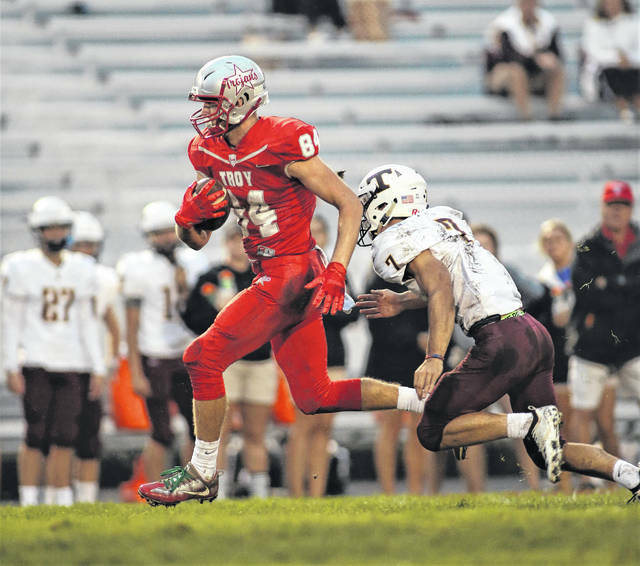 On a drive helped along by a rushing the passer penalty, Troy quarterback Brayden Siler capped off the scoring drive with a 12-yard slant pass to Shane Shoop, who also was in on a number of key stops on defense throughout the night. Siler finished by completing 10-of-14 passes for 149 yards. 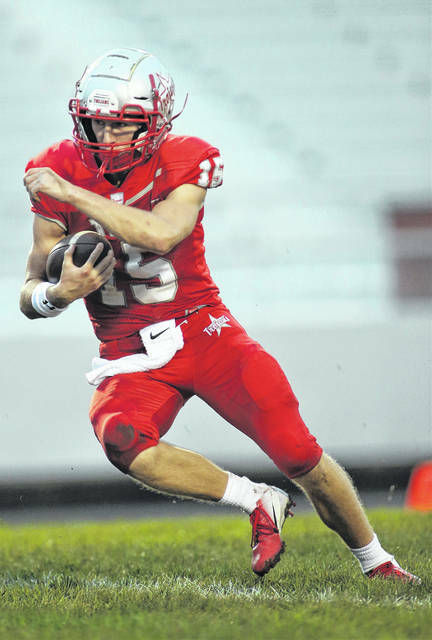 His leading receiver was tight end Spencer Klopfenstein, who had four catches for 65 yards. With a three-score lead, Troy was able to pound the ball with Culp-Bishop the rest of the night for the win. He would shake loose for a 23-yard touchdown run midway through the fourth quarter. Earlier in the game, Troy’s defense forced a 17-yard punt on Turpin’s opening drive, giving the Trojans the ball at their own 45. Sam Jackson and Culp-Bishop gashed the Spartan defense, with Culp-Bishop eventually cashing in on a 1-yard touchdown run on fourth down to give Troy an early 7-0 lead. Turpin would answer on the following drive with a 43-yard touchdown pass to tie the game. 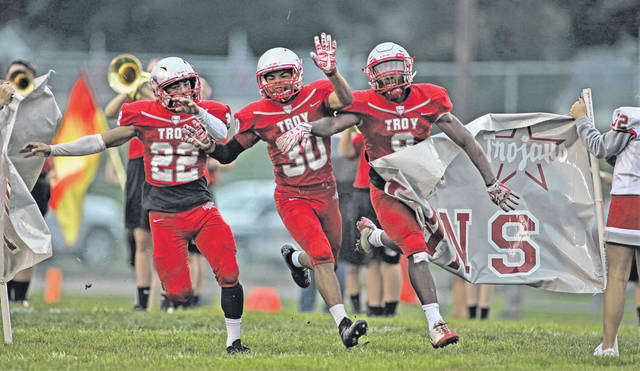 From there, though, Troy dominated the game to remain undefeated heading into next week’s game at Stebbins. Except, maybe, for thank you very much. https://www.tdn-net.com/wp-content/uploads/sites/21/2018/09/web1_090718lw_troy_adamdecerbo-1.jpgLee Woolery|Troy Daily News Troy’s Adam Decerbo forces a safety during Friday’s game against Turpin at Troy Memorial Stadium. 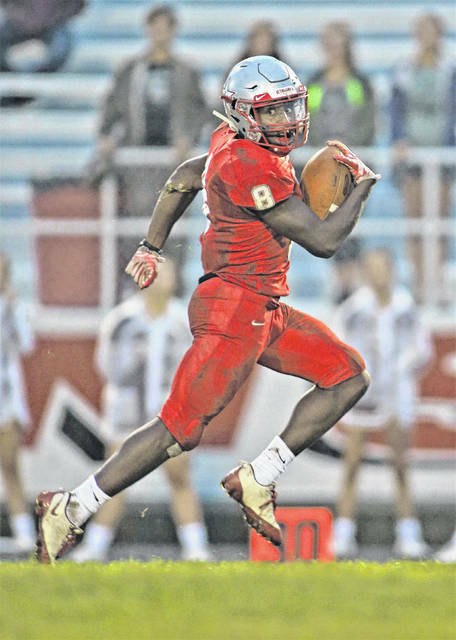 https://www.tdn-net.com/wp-content/uploads/sites/21/2018/09/web1_090718lw_troy_culpbishop-1.jpgLee Woolery|Troy Daily News Troy’s Jaydon Culp-Bishop runs a free kick back for a touchdown after the Trojan defense forced a safety Friday against Turpin. https://www.tdn-net.com/wp-content/uploads/sites/21/2018/09/web1_090718lw_troy_klopfenstein-1.jpgLee Woolery|Troy Daily News Troy’s Spencer Klopfenstein breaks past the Turpin defense for a big gain Friday. 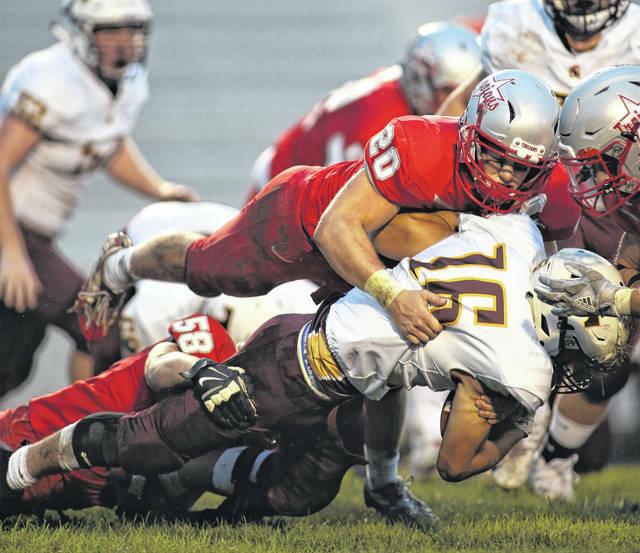 https://www.tdn-net.com/wp-content/uploads/sites/21/2018/09/web1_090718lw_troy_blakeburton-1.jpgLee Woolery|Troy Daily News Troy’s Blake Burton stuffs a Turpin ballcarrier Friday. https://www.tdn-net.com/wp-content/uploads/sites/21/2018/09/web1_090718lw_troy_tuckerraskay-1.jpgLee Woolery|Troy Daily News Troy’s Tucker Raskay carries the football Friday against Turpin. https://www.tdn-net.com/wp-content/uploads/sites/21/2018/09/web1_090718lw_troy_5_10_22-1.jpgLee Woolery|Troy Daily News Troy’s Jacob Adams (10) and Kobe Feltner (22) stuff a Turpin ballcarrier as Sam Jackson (5) looks on Friday. https://www.tdn-net.com/wp-content/uploads/sites/21/2018/09/web1_090718lw_troy_siler-1.jpgLee Woolery|Troy Daily News Troy quarterback Brayden Siler scrambles for yardage Friday against Turpin. https://www.tdn-net.com/wp-content/uploads/sites/21/2018/09/web1_090718lw_troy_22_30_8-1.jpgLee Woolery|Troy Daily News Troy’s Kobe Feltner (22), Jacob Shoop (30) and Jaydon Culp-Bishop (8) break through the banner during the pregame festivities before Friday’s game against Turpin.